Easy Downloader is like an all-in-one Download Manager app with fast download capabilities and file management features. It includes audio player with playlists, video player: avi, flv, mp4, mkv..., decompress ZIP and RAR and 7zip, ad blocker and much more... if you want to Download and play audio, video, view PDF files, extract ZIP or RAR, Easy downloader is your App. Download like you were on your computer. √ Navigation bar and toolbar are hidden while browsing (like safari). √ The bookmark, History and cookies management. 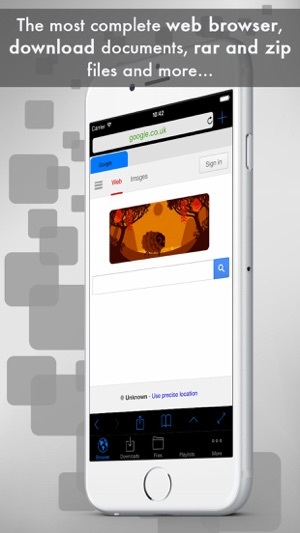 √ Supports Web Search Engines (Google, Yahoo!, Bing..) or add custom search engines. √ Hide the tab bar to have a bigger browser. √ Modify the type of browser detected by websites: Safari Mobile, Safari or Firefox. √ Always try to get the correct filename. √ Supports Multitasking: download continue at background. √ Shows active downloads badge number indicator in the browser screen and on the home screen. √ Audio player that includes playlists and equalizer features for your music needs. √ Image editor with zoom and tools to crop, resize, and different rotations. √ Includes an image viewer. 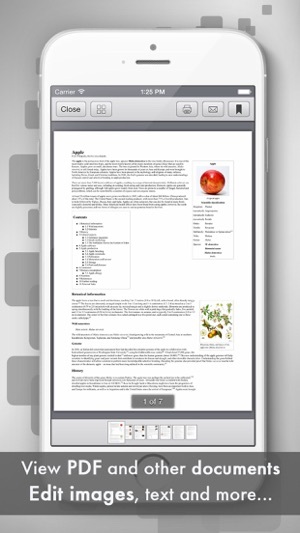 √ Pdf viewer with paging and zoom. √ Save images to camera roll. √ Access Dropbox, Mega, Box, GoogleDrive, OneDrive, WebDAV and Upload and Download files, Create folders, Rename files, view Photos. 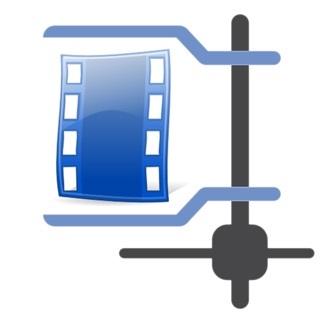 √ Save and get pictures or videos to Photo Library with its original quality. √ App can Save & Open file with other apps. √ A pin code, pattern or Touch ID can be set to restrict the access to the application. We are constantly working hard on making Easy Downloader better and more useful for your download and file management needs. Please feel free to email us for any queries/suggestions/problems or if you just want to say hi. We would love to hear from you. If you have enjoyed any feature of Easy Downloader, do rate us on app store. Start referring your friends to enjoy this amazing file manager and download manager with a lot of features. This app was very handy before, and worked without a hitch. I upgraded to the Pro version after using the Lite version for a while...and now it’s useless. The other browsers available through eDL to download video aren’t working for mobile devices either. I don’t recommend this app at all in the current version. I will revise this review if and when eDL is restored to working order. Perfect for what I need it for: music. The only problem I have is that the transfers button is now away from the browsers button. I don’t know if that was a suggestion but, it doesn’t make sense to me. When you download something on the browser it will appear in the transfers tab which is now away from browsers tab. I may be picky, but I like consistency. Great app though! Highly recommend! The good: BT & Open In import/export, its own file system, EQ, CLEAR variable speed playback (many other apps falter at this whereby slow speed playback sounds broken up, but this app is smooth!). The bad: The menu system is kind of a mess, probably because there are so many features. If you use this app often you'll get used to it, but it could be improved. Overall I recommend this app!